Main St and Church St.. 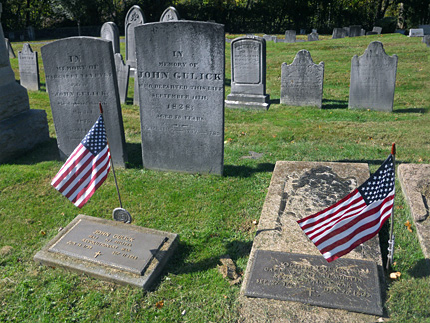 The other twelve markers in this series can be found in Princeton, Griggstown, Bridgewater, Somerville, Bedminster, Bernardsville, Basking Ridge, Harding Township and Morris Township. 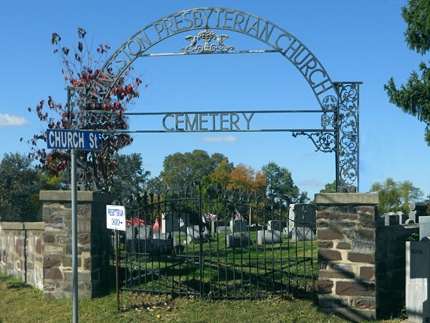 For a map tracing the route of all thirteen markers from Princeton to Morristown, click here. In 1777 at this location, the road from Princeton divided in two: one path went to New Brunswick and the other went north towards to Morristown. 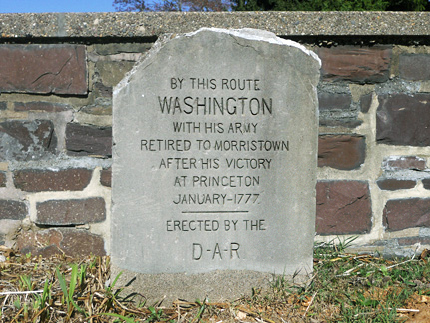 It was at this site during the army's journey from Princeton to Morristown, that Washington held a conference with his officers where a critical decision was made. Following the victory at Princeton, Washington had considered attacking the British troops at New Brunswick. However, due to the tired condition of his troops, who had fought in battles at Trenton and Princeton over the previous couple of days, Washington decided to move the army to Morristown for winter quarters rather than make an attack on New Brunswick. "My original plan, when I set out from Trenton, was, to push on to Brunswic[k]; but the harassed state of our troops, many of them having had no rest for two nights and a day, and the danger of losing the advantage we had gained by aiming at too much, induced me, by the advice of my officers, to relinquish the attempt." 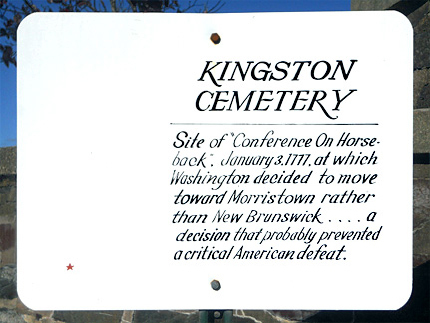 A year and a half later, the Continental Army would pass through Kingston again in another important march. In June 1778, the Continental Army were marching across New Jersey in pursuit of British troops who had abandoned their occupation of Philadelphia and were making their way to New York City. On June 25, the Continental Army reached Kingston, and they encamped here for the night. Three days later, the two armies would meet at Monmouth Courthouse (Freehold) and fight the Battle of Monmouth. Their website states that Rockingham Historic Site maintains a "collection of 18th-century furnishings and Washington military reproductions, a children's museum, and a Colonial kitchen garden." 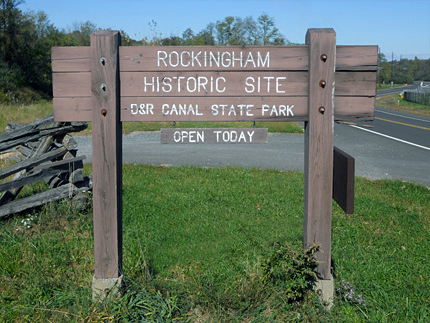 Rockingham was General Washington's final military headquarters of the Revolutionary War. He stayed at this house from August 23 to November 10, 1783. It was during this time, on September 3, that the Treaty of Paris was signed, officially ending the Revolutionary War. Due to the slowness of Atlantic Ocean travel in the 1780's, it took almost two months for the news to reach America. It was at Rockingham, on October 31, 1783, that Washington received the news that the Treaty of Paris had been signed and the war was officially over. Congress was at that time meeting in Nassau Hall in Princeton, when they received the news the same day. I consider it only fitting that after New Jersey's significant role in the Revolutionary War, both General Washington and Congress were in New Jersey at the time they received this momentous news! During Washington's stay at Rockingham, he entertained such visitors as James Madison, Elias Boudinot, Thomas Paine, and Annis Stockton, the widow of Declaration of Independence signer, Richard Stockton. 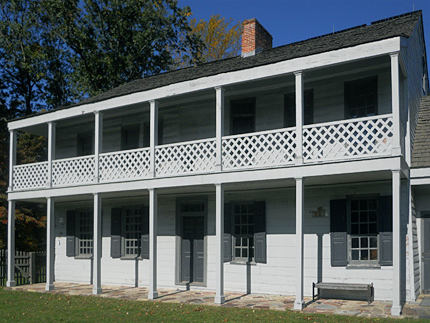 George Washington's wife Martha stayed with him for part of his time at Rockingham, although in early October she returned to Mount Vernon, the Washingtons' home in Virginia. Washington wrote his Farewell Address to the Armies of the United States while at Rockingham on November 2, 1783. 1. ^ This marker was erected by the Daughters of the American Revolution. • For more details and accompanying source notes about the Battle of Princeton and the 1777 Morristown encampment, see the Princeton and Morristown pages of this website. “General Orders, 25 June 1778,” Founders Online, National Archives (http://founders.archives.gov/documents/Washington/03-15-02-0565 [last update: 2015-06-29]). Source: The Papers of George Washington, Revolutionary War Series, vol. 15, May–June 1778, ed. Edward G. Lengel. Charlottesville: University of Virginia Press, 2006, p. 536. ▸ Note the quote from James McHenry diary which mentions the "hault [sic] at Kingston". “From George Washington to Major General Philemon Dickinson, 25 June 1778,” Founders Online, National Archives (http://founders.archives.gov/documents/Washington/03-15-02-0566 [last update: 2015-06-29]). Source: The Papers of George Washington, Revolutionary War Series, vol. 15, May–June 1778, ed. Edward G. Lengel. Charlottesville: University of Virginia Press, 2006, pp. 536–537. “From George Washington to Major General Lafayette, 25 June 1778,” Founders Online, National Archives (http://founders.archives.gov/documents/Washington/03-15-02-0571 [last update: 2015-06-29]). Source: The Papers of George Washington, Revolutionary War Series, vol. 15, May–June 1778, ed. Edward G. Lengel. Charlottesville: University of Virginia Press, 2006, p. 539. • For more information and accompanying source notes about the locations on this march, see the Lambertville, Mount Airy, Hopewell, Englishtown, Freehold, and Manalapan pages of this website. 5. 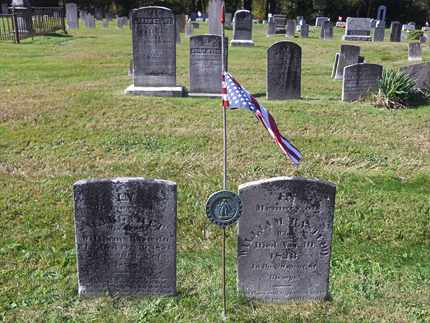 ^ Names, dates, and military information drawn from gravestones and markers in the cemetery.